Tis the Season for Savings on Niagara Falls Getaways! Experience a special Niagara Falls getaway this holiday season with Falls Avenue Resort’s Holiday Magic package, which will connect you and your family with some of the city’s best accommodations, dining, and entertainment, starting from only $189. Choose a stay at one of four Falls Avenue Resort hotels – including Skyline Hotel & Waterpark – for incredible accommodations just steps away from Niagara Falls, and also receive four two-day passes to the 3-acre Fallsview Indoor Waterpark. The waterpark can be accessed directly from the hotel via indoor walkway and features 16 thrilling water slides, a giant wave pool, 1,000-gallon tipping bucket, adult-only Jacuzzis, and much more. But the fun doesn’t end there! The Holiday Magic package also connects you with non-stop thrills and entertainment with four passes to Adventure Heroes Laser Ride, Wild Safari Mini Golf, Combat Bumper Cars, and an incredible Magic Show on select dates. And to complete the experience, you will receive a Kids Eat Free meal at Fallsview Buffet Restaurant or the Rainbow Room by Massimo Capra and a Kids Eat Free lunch or dinner at Planet Hollywood. Book your Holiday Magic package now for a stay any time between December 18th and January 3rd and give your family an amazing holiday gift they won’t soon forget! The Skyline Inn at Falls Avenue Resort team is pleased to announce that moving forward, the hotel will be operating under the new name Skyline Hotel & Waterpark. 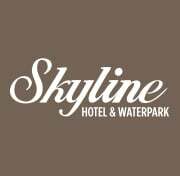 For eight years, Skyline Hotel & Waterpark has been committed to connecting families with both unforgettable hotel stays and Fallsview Indoor Waterpark experiences, which is a partnership that will now proudly be represented in the hotel’s name. The 3-acre Fallsview Indoor Waterpark is directly connected to the Skyline Hotel & Waterpark via indoor walkway and features 16 water slides, a giant wave pool, 1,000- gallon tipping bucket, and much more. Families staying at the hotel can easily access the waterpark, their guest rooms, and all Falls Avenue Resort entertainment and dining destinations, making each fun-filled family getaway both convenient and unforgettable. Visit skylinehotelniagarafalls.com and book your stay today!